The time to buy is when ‘blood is the streets’ as they say, but we haven’t quite reached that stage yet. One of the tell-tale signs is that the perma-bulls keep trumpeting the reasons and various metrics to buy this sector now; regardless of just how poorly it is performing. If you were of the opinion that the stocks were a buy when the HUI was standing at 630 then for every 100 points it has dropped it must have become a screaming buy and today a golden opportunity for investors. Then perma-bulls that have bought this sector all the way down are almost all-in so their effect on future prices is negligible as they don’t have the cash to follow through with actual acquisitions. The sign of a true bottom is when it goes eerily quiet and no-one wants to buy any of these stocks, volumes are miniscule and sentiment is in the basement. Is that the situation today, well its ‘close but still no cigar.’ Don’t despair; that time is coming and will be well worth the wait for those who have put aside some opportunity cash. For those who have sat through this decline most of the damage is behind you although there is more pain to come in the short term. This is the time when investors finally give up the ghost and sell their stocks and vow never to touch another gold or silver mining share ever again. When this happens we will see a sudden spike down in prices which will be the final capitulation that this sector has not experienced so far. We are all aware that when a bull market reaches maturity there is a final blow-off in prices with the charts going exponential. The same goes for the final stages of a bear market with the charts heading for the basement with considerable rapidity. Taking a quick look at the chart we can see that the HUI is struggling to stay above the ‘150’ level which is an important support level last seen in 2008. This level has been tested 3 times recently which is not a good sign for a sector which is supposed to have bottomed. 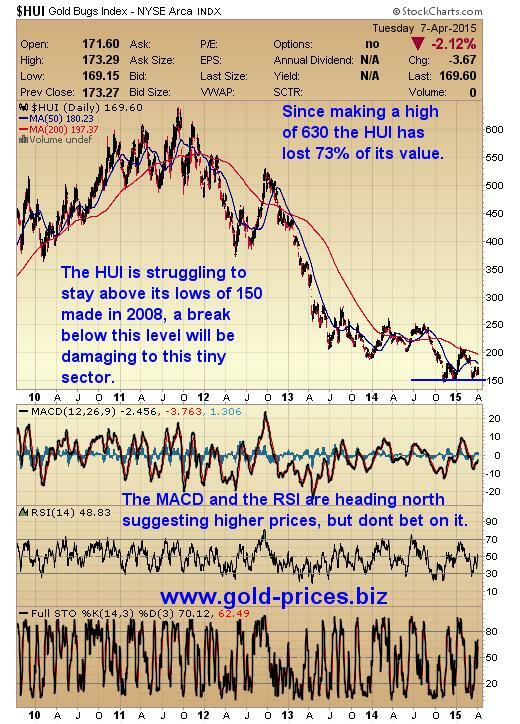 A chart of the unhedged gold miners. Gold has been doing well in most currencies other than the US dollar which is an argument for holding gold in those countries. However, it is still second best to the dollar so why settle for second place when you could be in the best performer; the US dollar. Keep the lion’s share of your investment funds in cash for now. Wait for a final capitulation before investing, unless you are very nimble and can trade in the short term, long or short. Wait for the data to confirm that the economy is either going well or heading lower, recent non-farm payroll numbers were very low and this may or may not be indicative of the future direction of employment. Watch the Fed for what they say and do and remember that they are ‘data driven’ so we have no clarity regarding the future of interest rates or even if QE is about to make a comeback. Do not buy the producers because they are cheaper than they have been cheaper does not necessarily mean cheap. This recent bounce in prices is already looking like another false dawn and there have been plenty of those over the last three years to at least make you a tad skeptical about this market. At the moment we have 70% of our funds in dollars and are happy to be in dollars as they have strengthened considerably; giving us more spending power for when the bargains present themselves.